The Galaxy S10 and S10+ are here one day early, sort of. Norwegian TV channel TV 2 has aired the launch advert for the Galaxy S10 and S10+ before tomorrow's Galaxy UNPACKED event in San Francisco. The advert confirms many of the S10 and S10+'s features including its Infinity-O display, its in-screen fingerprint sensor and the now rare headphone jack. The Galaxy UNPACKED event does not start until 11 am PST tomorrow in San Francisco, but we have got a preview of the Galaxy S10 and S10+ a day early courtesy of Norwegian TV channel TV 2. The channel aired the launch advert today, which confirms the extensive rumours and leaks about the new flagships. The advert shows the Galaxy S10+ with Samsung's Infinity-O display and dual punch-hole front-facing cameras. The South Korean company has included an ultrasonic in-screen fingerprint reader and a headphone jack too, with the Galaxy S10 series likely to be one of the few 2019 flagships to feature the latter. Moreover, it appears that the S10+ will ship with the three on-screen navigation buttons enabled rather than the full-screen gestures that it has incorporated in One UI. The S10+ also has three-rear facing cameras along with a heart rate sensor and an LED flash. The advert only shows the Ceramic white version, but we suspect that Samsung will also release the S10 series in several colours. There is Qi reverse wireless charging too as we have seen with the Mate 20 Pro, which will charge other smartphones, the Galaxy Watch and the Galaxy Buds. The end of the advert also shows the Galaxy S10, which has a single punch-hole front-facing camera as shown in previous leaks. 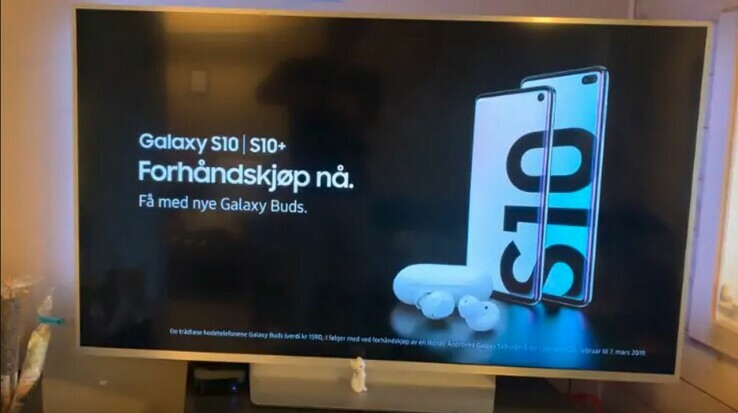 The advert gives us a look at the Galaxy Buds too that will be included with each Galaxy S10 pre-order, at least in Norway. The promotion will run from February 20 to March 7, according to the advert. We will keep you updated with all that is announced tomorrow at the Galaxy UNPACKED event, but you can also watch a live stream on Samsung. It appears that the second YouTube we had originally included has been removed by the user. It showed the advert playing on a TV. Fortunately, Gadgets.ndtv took a screengrab before it was taken down.